According to the font of all human knowledge, Ship of Theseus is “ is a thought experiment that raises the question of whether an object that has had all of its components replaced remains fundamentally the same object.” In the case of AKERCOCKE, Britain’s most underrated metal act of the last 20 years (eat your heart out CRADLE OF FILTH), the comparison is at once apt and yet abstract especially in consideration of the fact that the band has not changed members. The band has changed its clothes. The band has basically existed in a suspended animation for a decade and in that time various members of the band have formed other projects, namely the excellent VOICES and THE ANTICHRIST IMPERIUM. The band has come back, released a new album, and become a totally different beast than the one you may recall from the halcyon days of the early aughts. AKERCOCKE has arrived in a way that they hitherto had only hinted at. It bears mentioning that during their sojourn into inactivity, frontman Jason Mendonça struggled with his mental health, a fact that he speaks to earnestly in interviews. In a society in which mental illness is both a flashpoint and a malignant sore to some, it is vitally important to be honest with these struggles as we are all on this rock together. And so, together we should rock! 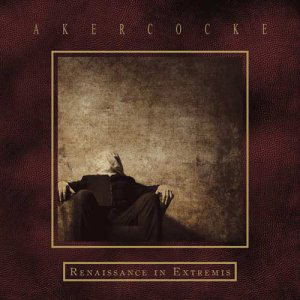 Lyrically, Renaissance In Extremis finds AKERCOCKE shedding the overt Satanism of their earlier lyrics in favor of a more intensive and personal experience for the listener. Now, that is not to say that the previous lyricism of, say, “A Skin For Dancing In”, is amateurish or poorly constructed, but the effects are different. As a listener, and fan, for AKERCOCKE’s entire existence, I can and must look at each as separate entities. Truly, Renaissance In Extremis is their debut in their new and ever evolving form. “But, what about the music?” I can hear you saying. Well, AKERCOCKE are no longer a Black Metal band. AKERCOCKE were never a Black Metal band (too well dressed), injecting bits of progressive poclivity into their aural assault before kinda losing the plot a bit around “Antichrist”. On Renaissance In Extremis the band fully embrace the progressive end of their sound, recalling at points acts as disparate as YES and GENESIS while constructing melody and nuance that is wholly their own. Just listen to “A Final Glance Back Before Departing” and feel the ecstatic prog tendencies wash over you. Or better yet, allow the gentle and almost nouveau smooth jazz horn section and accompanying spaced out vibe of “A Particularly Cold September” to transfix before utterly shredding. Bearing mention of course are the vocals, wherein almost gone are the frantic high pitched warbles of times passed and in their place are plaintive and expressive clean vocals permeating the album and juxtaposed against the beastial howls Mendonça alone is in sole control of. Lyrically, again, Renaissance In Extremis is a naked and emotional journey, which is unique for this brand of metal but really has never been far from the fore of AKERCOCKE even at their best dressed and most evil. If you have never heard AKERCOCKE before, this album is essential. If you have, this album is essential. Renaissance In Extremis is representative of a band reborn, of a sound completely unique in its execution. I wanted it to be more brutal, more visceral, but honestly after continued listens have found that AKERCOCKE delivered exactly what I, and they, needed. AKERCOCKE delivered their most powerful outing to date and have ushered in their own renaissance and on their own terms. The achievement is towering and complex and worthy of repeated listens and intense examination, and above all, a worthy introduction into their cannon of work. Hopefully the next one does not take ten years.